A tie again? 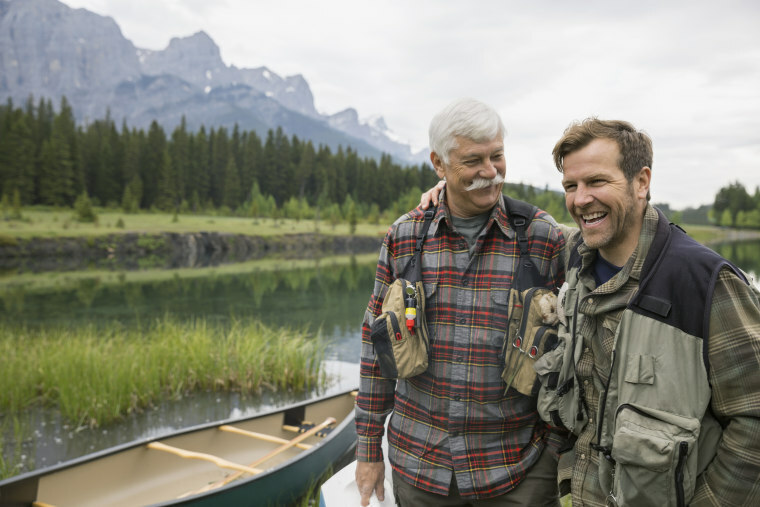 This year, give dad something that will let him indulge in his favorite pastimes. We love our dads — whether it’s the guy who kept your secret when he spotted you rolling in past curfew as a teenager or the one sharing diaper duty or helping you pack school lunches now. But a recent survey of more than 1,200 U.S. consumers conducted by men’s gifting company Man Crates found that we may not be great at showing it in gift form. They found that 84 percent of people care more about Mother’s Day than Father’s Day, and that 40 percent of people are more likely to shop for mom. And of those who are purchasing presents for dad, the majority of people admitted to buying boring gifts like ties and belts. But the outlook isn’t entirely bleak for all the dads out there: A survey conducted by the National Retail Foundation found that 77 percent of Americans will celebrate Father’s Day and spend an average of $133 per person — with Americans spending a near-record 15.3 billion collectively. So why not use that cash to give the father in your life something he'll actually like? Spare dad from having to hang the hundredth tie in his closet and get him something that will elevate his lifestyle — whether he loves cooking for the family, cheering on his favorite sports team or hitting the gym (and then enjoying a cold one). If his hobbies include hiking, camping, hunting or fishing, this gift will win you favorite child status this year. No more making room for water bottles in his backpack — or carrying the extra load — to stay hydrated while hiking to his destination. This bottle, with a built in filtration system, filters water of chemicals, pesticides, bacteria and protozoa in just 10 seconds, reducing contaminate levels far below EPA standards for safe drinking water. So any fresh water source is now fair game for dad to quench his thirst. Science tells us that being outside in nature is not only great for our physical health, but for our mental health as well. So why not make it even easier for the dad on your list to pack up his gear and hit the trail? This carry-all will give the outdoor enthusiast peace of mind that he'll have dry, clean clothes to change into regardless where his adventures take him. One reviewer described this backpack from Yeti — a brand known for its durability — as "virtually indestructible." Whether he's wading in water or gets caught in an unexpected downpour in the woods, he won't have to worry that all of his gear stays dry with the 100 percent waterproof shell and zipper with an airtight seal. If hosting a barbecue means your husband or father spends the entire afternoon behind the grill, this handy tech tool will be his new best friend. The wireless meat thermometer takes all the guesswork out of cooking the perfect slab of meat — whether he's roasting chicken, cooking steaks or grilling salmon. All he has to do is insert the thermometer into the raw meat and select the type of item he's cooking, and the app will estimate the cook time. The convenient countdown clock shows how much time is remaining so dad can crack open a cold one and enjoy the BBQ — instead of having to “man” the grill all afternoon. Some of our favorite summer memories were spent grilling out in the backyard with our family. But dad is still using the same grill since your childhood, chances are, it's seen better days. You know he'll never go out and invest in a new one himself ("the rust adds more flavor! "), so use the holiday as an excuse to set him up with this top-rated model. Reviewers give it top marks for being user-friendly and versatility (great for basic grilling and more complex slow-smoked barbecue); plus it's surprisingly affordable. For the dad who is really just a big kid at heart, allowing him to indulge his love of video games on the go can actually be good for his health. Studies have suggested that hitting the sticks may improve memory, enhance cognitive function, and can help reduce pain and anxiety about medical procedures. With Gamevice your dad can have over 950 compatible games right at his fingertips — whether he's commuting to work or waiting in a long line at the post office. The device connects directly to your smartphones charging port without needing to pair or charge it. Think of it as giving your home a brain — so your dad can take a load off his. He can connect appliances, lights, speakers, locks, cameras, thermostats and more, and control, automate and monitor them all from his phone using the app. The system will give him peace of mind while the family is away on vacation and also save him from those daily stressors like remembering if he locked the front door or left the air conditioning on for the dog. The father who lights up your life will be the life of the tailgate with this duffel. Filled with all the essentials for grilling out before the game, there will be no more scrambling to make sure he has all of his gear before heading off to the stadium (or little league field). The heat-sealed main compartment serves as a cooler and fits 46 12-ounce cans, while the side pocket stores grilling tools, a cutting board, a corkscrew, an oven mitt and salt and pepper shakers. For the dad who likes to take the party in-house, allow him to really channel his team spirit by proudly displaying his favorite team's logo front and center (preferably surrounded by game-day snacks). This coffee table features a reversible logo panel that can be flipped to display a plain black panel — so mom can flip it back to an incognito "normal" table after game day. Have a little something dropped on the door step of the most fashionable dad (or those who could use a little help in that department) each month. Each box contains 4-5 stylish lifestyle accessories — think fashionable socks, watches, tie clips, leather cord holders, coasters — and one grooming product, that’s guaranteed to have over $100 in value. Don't be surprised if dad shows up looking especially dapper to your next family brunch. For the dad who is climbing his way to the corner office and needs to look the part, gift him a custom made suit that he can design to perfectly fit his frame and his style. Especially great for those that dread shopping, Alton Lane offers a unique experience at their 13+ showrooms around the nation, which are equipped with fully stocked bars, poker tables, TVs and more so that he can get the full man-cave experience, and enjoy time relaxing with friends and family while designing his perfect suit. When it comes to buying a new gym bag, there are endless options. What makes this one stand out? Compartments galore. We’re talking a compartment for literally everything. Sneakers, dirty or wet clothes, shower sandals, a water bottle, phone and headphones — plus an over-sized main opening so dad will never find himself rummaging through his bag looking for something again. With everything he needs to get his workout in easily accessible, the only thing this duffel doesn’t leave room for is a dad bod. Call all your siblings, it’s time for the most epic group gift. The price may seem steep, but when you stop and think of everything you’re getting for the value, it's a steal. The incline trainer offers over 12,000 workouts (from HIIT to cardio to strength training) with interactive coaching on a 22" interactive touchscreen, plus workout tracking that will help him dig deep into his stats and work towards his next fitness goal. But most importantly, it makes fitness fun. Dad can really feel and experience terrains from around the world: a morning run through Cinque Terre, Italy, a strength training circuit in Antarctica and an after-dinner walk in Botswana. Plus, unlike competitor's models there's no membership fee, so all new features and access to newly released workouts is bundled into the price. You can’t go wrong with some clever glassware to hold his favorite suds. For the dad that loves a good board game night or round of darts at the bar, these handcrafted glasses featuring a battleship grid provide a fun activity to enjoy with his beer. Maybe you'll be lucky enough to snag the coveted spot as his drinking partner. If your old man would rather enjoy his beer in peace, these beer diagram, "Pick" Your Poison Guitar Glasses or HTML Beer glasses may be more his style. If your old man loves trying new local beers and heading to craft breweries to see how it's made, why not give him a new weekend hobby and let him take a stab at it himself? This kit takes the love of beer one step further for the true aficionado, letting him brew his own batch in house. It's one of the few kits on the market that provides absolutely everything you need in one box — right down to the tubing and bottle caps. So there's no need to make a run out to the store before he gets started. The sooner he starts brewing, the sooner he can enjoy the fruits of his labor right? The perfect carry-on for the man on the go. The backpack has three storage compartments — two main ones, and a full-size front pocket — plus tons of additional pockets for a passport, keys, headphones and all the other things he needs easy access to during work trips. But the best feature is the protective suspended tech cell inside made to hold a laptop and elevate it from the bottom of the bag, so it never hits the ground. If the dad on your list prides himself on "never checking a bag," this rolling bag will help him pack and organize everything he needs for a short trip. It has two main compartments, one designed for clothes, the other for shoes, toiletries, and other hard objects, plus a nylon laundry bag to separate the clean clothes from the dirty. The outside features an impenetrable shell that bends under pressure (you know, for when the passenger next to him forces his over-sized bag into the overhead bin), plus a battery that can charge any phone up to five times, so he will never be frantically looking for an outlet in the airport. This 18-in-one tool allows the handyman on your list to carry his toolbox in his wallet. Yes, 18 gadgets are combined into a compact steel tool the size of a credit card. The tools range from your standard toolbox additions like four types of screwdrivers, a ruler and a nail puller to more unique, useful everyday tools like a fruit peeler, an eyeglass screwdriver and a cellphone stand. The perfect tool to have on the ready for every and any "Mr. Fix It" situation that arises, this device keeps 17 tools in one convenient place. Who needs to lug a big toolbox around when you can have pliers, replaceable wire cutters, wire stripper, plain and serrated knives, saw, spring-action scissors, ruler, files, screwdrivers and even a bottle opener right at your fingertips? You're definitely going to want to keep this handyman on your speed dial. Are Daddy's Little Girls Treated Better Than Little Boys?